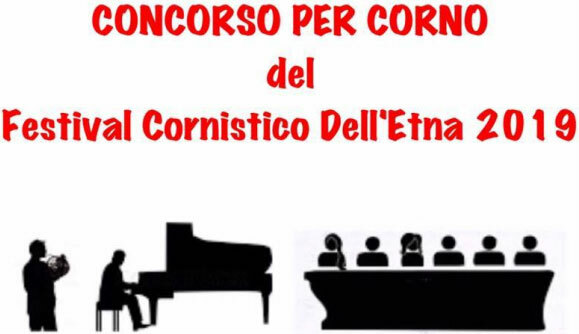 The competition will take place at the Auditorium Ex Collegio Sant'Anna in via Roma 254 in Zafferana Etnea (Catania) on August 19, 2019 at 3:30 pm. The application form for the competition can be filled in using pdf this form (33 KB) and must be made no later than July 15, 2019. Applications submitted after the deadline may be taken into consideration at the sole discretion of the management of the competition. 1st place will be awarded a voucher of € 200 at the Festival partner musical store "Magazzino Musicale Miceli". Furthermore, the winner will perform as soloist at the prize-giving concert. 1st place will be awarded a prize offered by the horn mark "Engelbert Schmid" which will consist of the free registration plus travel, board and lodging at the high-level masterclass "Mindelzell Horn Days 2020" organized in Mindelzell (Germany) by E.Schmid with world-renowned hornists such as Phil Myers, Bruno Schneider and many other great horn players on the world scene, as well as an E.Schmid mouthpiece. The winner will perform solo at the prize-giving concert. 2nd place will be awarded a € 200 voucher for repairs offered by the "Casalanguida Musical Instruments" partener. Furthermore, the winner will perform as soloist at the prize-giving concert. 3rd Place will be awarded a € 100 voucher for repairs offered by the "Casalanguida Musical Instruments" partener. Furthermore, the winner will perform as soloist at the prize-giving concert. All the winners of the Competition will receive the certificate of suitability. Declare if you need the accompanying pianist. In case the accompanist Pianist is necessary, the candidate must apply for it upon registration, attaching copies of the pieces to be performed and must pay an additional fee. Participant pianist fee for participants will be € 25 to be paid together with the registration of the Festival. Subsequently with the pianist the participants will agree a test to be done with him on August 18th (the first day of the Festival). The organization will provide candidates with a half-tail piano for the competition, and two digital pianos in the Festival structure. (Free program of maximum 15 minutes) plus one piece chosen from two compositions by Maestro Donato Semeraro downloadable on the web page of the competition in the download section below. Execution of the obligatory piece “Excursus” for horn solo by Maestro Donato Semeraro that you can download in the contest web page in the download section below. The jury has the right to stop the performances at any time of the test or to listen to the competitors if it deems it appropriate. The judgment of the Jury is final. The members of the jury who have didactic and / or kinship relations with competitors will abstain from voting. If the Jury does not find the expected requirements in the participants, it reserves the right not to award the prizes. Participation in the competition implies full and unconditional acceptance of this regulation, as well as any changes made and from the artistic and organizational direction. The organization of the competition assumes no responsibility for any risks or damages of any nature to persons or property.